The historical evolution of the products is strictly inter-connected with packaging; content and container have often been an inseparable unit leading to the final product. The concept of packaging, intended as a tool for protection, conservation and transport of human labour product, accompanies human history from its origins. In functional terms, packaging is the answer to a deeply archaic need. From rudimentary containers in leather or clay, to bowls and urns in metal, to amphorae and containers in glass and ceramics, the production of products suitable for containing and transporting food and precious objects has seen the birth of small and great innovations over the centuries. Following the first tin packaging and the invention of printing, the first containers with labels were also born, paving the way for a new communicative function for packaging. Yet, it is following the first Industrial Revolution, and the discovery of new materials and industrial processes, that packaging begins to acquire its contemporary value. 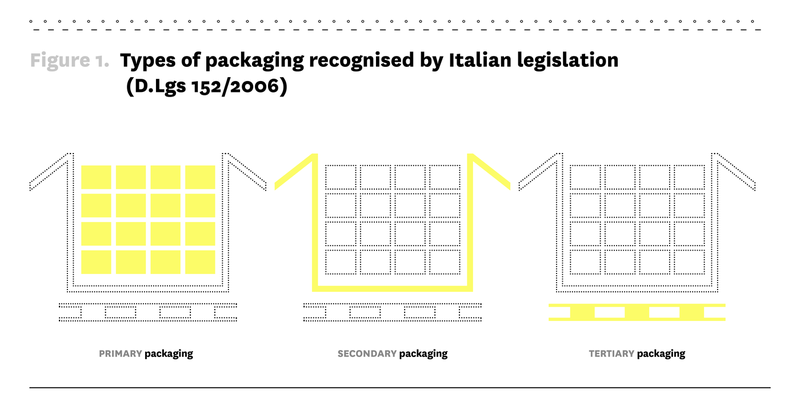 Through the relationship between the intrinsic demand for functionality and a set of expressive-communicative requirements, packaging acquired its importance, which later further improved trough regulated by local and national laws. At the beginning of the twentieth century, with the rapid arrival of self-service stores and a growing market internationalisation, the system of functional, communicative and regulatory needs became increasingly complex: packaging faced new challenges in relation to transport, protection and communication. In this context, aluminium appears among packaging materials: firstly, for the production of beverage and food cans, later for the production of aluminium foil, tubes, capsules and caps and, finally, of spray cans and blisters. During the 20th century, aluminium packaging saw numerous innovations that allowed its increasingly flexible use. These innovations led to production speed increase, safety and functional effectiveness and the possibility of customisation. Not least, at the end of the century, a new sensibility towards the environmental impact of packaging was born and, consequently, the attention to the possibilities of material valorisation and recycling. In this sense, aluminium is particularly interesting thanks to its excellent recyclability and endless reusability while maintaining the characteristics of the virgin material. Transit packaging or tertiary packaging: packaging designed to facilitate the handling and transport of goods, from raw materials to finished products, of a certain number of sales units or multiple packaging to prevent their handling and damage related to transport, excluding road, sea and air transport containers." This complexity is also expressed through the widespread use of the English term packaging in the Italian language. Despite being the literal translation of the term imballaggio, in English packaging assumes a broader meaning. This is not limited only to the totality of the operations that allows the containment and transport of goods, but also refers to the entire process of functional and communicative design, production and end-of-life management. What is today defined as "packaging culture" summarises an important design trend: the whole set of functions of contemporary packaging is perceived within a comprehensive and complex framework. Within this framework all different packaging requirements are integrated in order to create something that can be defined as "good packaging" by being able to effectively respond to all required functions, starting from user's safety up to environmental sustainability. And "if packaging is the result of the shared work of many actors, from raw material producers to the final consumer, the final result of a “good packaging” is everybody’s satisfaction”. As previously seen, in the contemporary self-service sales context, packaging must respond to stringent transport, protection and handling requirements on a large scale. In addition, it is also the first communication element that comes into contact with the end user, taking on the task of effectively responding to purchase needs, doubts and expectations and the product management. The packaging thus becomes a functional and communicative mediator amongst the manufacturing company, the logistics operators, the sales point and the end user: it must convey the product both from an “information-value” point of view and in terms of the functional needs of usability, protection and transport. Although function and communication are the two main requirements that packaging must meet, the complex framework of needs that involves contemporary packaging design is wider. Firstly, regulatory requirements for packaging are increasingly stringent, not only in establishing the parameters of functionality and safety, but also in identifying the information to be conveyed in relation to the product and the packaging itself. Secondly, increasing sensitivity on environmental issues and on the potential impacts of packaging waste has introduced new criteria for environmental sustainability. Functional requirements. This category summarises the complex set of requirements to protect, contain and transport the product (performance requirements) and user’s handling -interaction requirements (operational requirements). Communication requirements. The category includes communication functions that respond to different objectives: catching user's attention (appellative function), identifying the brand and the product (identification function), motivating the purchase choice (persuasive function), informing the user about the product and the packaging itself (information function), to facilitate the use of the packaging and the product (prescriptive function). Regulatory requirements. The regulations that packaging must satisfy vary according to the place of production and sale, the material of which the packaging is composed and the type of product contained. In general, it is necessary to distinguish between mandatory requirements, which packaging must necessarily satisfy and which mainly concern the safety of the product and the user, and voluntary requirements, which include compliance with technical standards regarding different aspects of packaging. Environmental requirements. This category is crosscutting to the previous ones: environmental requirements involve design aspects that concern both function and communication, and can be determined by binding and voluntary regulations. In general, the category defines a set of points of emphasis that the project can take into consideration to improve the packaging environmental sustainability. However, these categories are not individual but overlap each other along all stages of the packaging life cycle. Meeting the requirements as a whole defines the quality of packaging and therefore the design effectiveness of a "good packaging". Certainly, safety and functional performance remain the main design focus, but communication and sustainability are transversal and complementary elements to consider. In particular, it is important to underline how environmental requirements, at a design stage, do not constitute a category of their own but are configured as a common integrated system that involves functional, communicative and regulatory requirements. This relationship is not unique but multidirectional: environmental requirements cannot be separated from functionality but, in fact, work and implement it. Similarly, environmental sustainability and communication are parallel elements that influence each making communication sustainable or “communicating sustainability”. The relationship with regulatory requirements is also characterised by a mutual bond in which the compliance with the rules comes first, but, at the same time, packaging environmental sustainability becomes the object of legislation (mandatory or voluntary). In this perspective, recycling activity and the design measures that promote it are not to be read as separate guidelines. 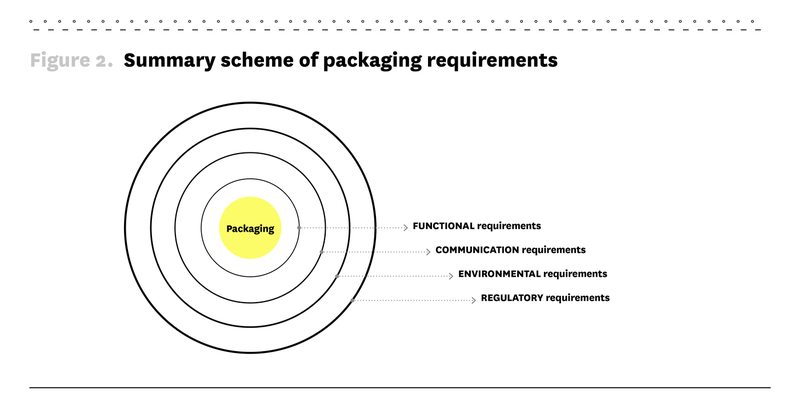 On the contrary, they should be perceived as key elements that the project can integrate into the complex system of functional, communicative and regulatory requirements of packaging. Recycling and its design measures should be analysed within a perspective of coherence and greater design effectiveness. The meaning of this publication, focused on aluminium packaging, is to offer practical design ideas for the improvement of aluminium packaging recyclability while presenting concrete environmental guidelines in an integrated and systemic way, in order to provide packaging designers with effective design tools. Packaging design is a crucial phase for the environmental impact prevention of the packaging life cycle. The legislation itself recognises the importance of acting "in particular through the development of non-polluting products and technologies" to prevent the potential impacts of packaging on the environment and improve its sustainability throughout the entire life cycle. The primary objective that the European Community and its member states have been pursuing in recent decades is to move from the concept of packaging as “waste to manage” towards a vision that sees and promote waste as a new resource for local and national production systems. The new "European Commission Circular Economy Package" brings together proposals covering the entire product lifecycle, from production, to use / consumption phase, to waste management and to the secondary raw materials market. The common objective is to "close the circle" of product life cycle by increasing recycling, to maximise the use and the value of raw materials, products and waste, with consequent environmental and economic benefits. In the strategies promoted, packaging waste recycling plays a particularly important role: alongside an increase in the recycling targets for packaging material, the Community proposals aim to improve the management of packaging waste in all sectors, from urban to industrial and commercial sectors. The reference legislation is constituted by the Directive 94/62/EC on packaging and packaging waste (G.U. L365 / 199 of 31.12.04) plus subsequent updates. The directive annexes establish the essential requirements for both environmental impact prevention and packaging recoverability, through reuse, recycling, energy recovery and biodegradation. All these recovery strategies are not considered equal by European and Italian legislation, as they considered within a preferential hierarchy. This promotes prevention as the main strategy and, in terms of recoverability, prefers packaging reuse and recycling. On the other hand, it identifies energy recovery and, finally, disposal as strategies to be pursued only following the previous ones. In terms of prevention, Directive 94/02 / EC recognises the importance of acting on a design level to "limit volume and weight to the necessary minimum to guarantee the necessary level of safety, hygiene and acceptability both for the packaged product and for the consumer ". It also indicates the need to design the packaging in order to" allow re-use or recovery, including recycling, and to minimise its impact on the environment if packaging waste or the residues of its management operations are disposed of". Finally, the directive recommends minimising the presence of hazardous substances, in terms of material/components, emissions and possible packaging waste management operations residues. To help designers and companies verify the compliance of their packaging with the essential requirements established by the Directive, the CEN (European Standardization Committee) has implemented some harmonised European technical standards, made available in Italy by the UNI. In particular, the UNI EN 13430: 2005 standard on "Packaging - Requirements for packaging recoverable by material recycling", groups together all supply chain interventions to optimise the collection, selection and recovery of packaging. Specifically, the packaging placed on the market must meet two main requirements: to demonstrate its material recoverability and to determine the percentage of material recycling. This provides a complete analysis of the packaging life cycle by taking into account the criteria that affect its recyclability. Overall, recyclability and design attention towards this topic are key elements recognised by national and European legislation. Aluminium packaging, which is the object of the present publication, presents an excellent recyclability thanks its material characteristics, which allow endless reuse without performance falls compared to the virgin material. Yet, it important to pay attention to some design elements that can increase aluminium packaging recyclability and make the recycling process less impacting on the environment. The objective of this document is therefore to offer to designers, producers and users some design information useful for facilitating the recycling of aluminium packaging for domestic use. 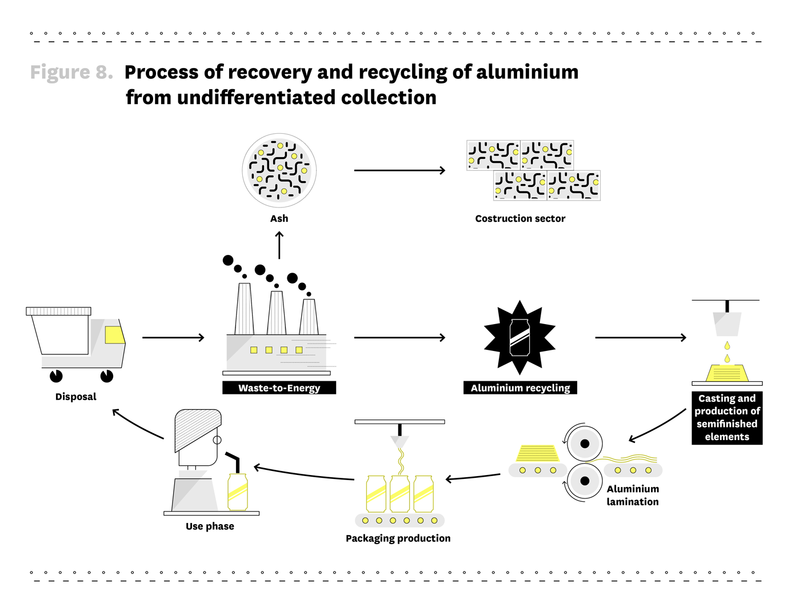 The aim is to explain some of the needs, problems and potential of packaging recyclability and to stimulate an increasingly responsible innovation of products and processes connected to the aluminium packaging supply chain. The identified tools are guidelines accompanied by special checklists. The approach is to make available to designers and companies a common ground for discussion on such complex and little known subject. It is also evident that there are no absolute valid indications for each type of packaging: packaging has many differences of structure, composition and performance that lead to consequent differences in the management of the end of its first useful life. For this reason, in the design phase, a dialogue amongst the all supply chain players is necessary to verify the results obtained throughout the whole packaging-product life cycle. This should be done with the support of industry experts and is essential to ensure an effective improvement of environmental performance in terms of recyclability. The issue of packaging recyclability should take into consideration the real possibilities offered by the current selection and recycling technologies installed at industrial level (current technology status) in a given geographical area. The indications provided will then be periodically updated by CONAI. Knowing the processes and their peculiarities helps to understand on which phase a choice can influence the project and which are the most suitable alternatives. The publication is divided into four parts that want to meet the needs of designers and companies through a path that starts from material and recycling process up to the types of aluminium packaging. This is to clarify the motivations behind the design suggestions proposed in the conclusive guidelines. 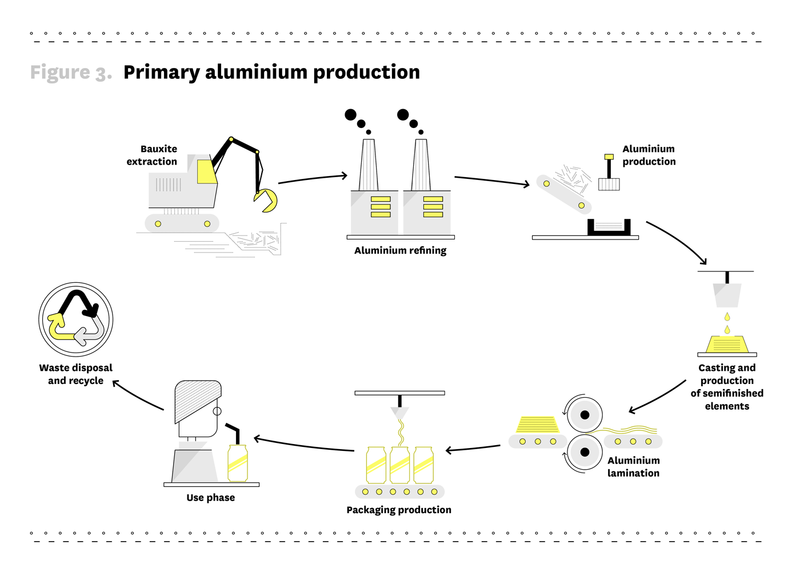 The first part describes the characteristics of aluminium and the primary and secondary production process of the material, in order to define the main working phases that allow its use for the packaging sector. The second part describes the processes of collection, selection and recycling of aluminium packaging, focusing on the main types of packaging and highlighting, for each of them, the key elements related to recycling activities. The third and the fourth part present the guidelines to facilitate aluminium packaging recycling for domestic use and destined to separate waste collection. The guidelines will offer the designers useful checklists about the design phase, its evaluation and its development to further improve the existing packaging. To resume, this document aims to be the starting point for a broader project path that considers the importance of facilitating the selection and recycling of packaging and favours a new concept of waste as a resource, towards a Circular Economy perspective. The presented guidelines aim to highlight the possible problems and relative solutions, which do not pretend to be exhaustive and complete for each specific situation. For this reason, at the end of the document we reported all references and sources consulted and the normative indications useful to deepen the contents of the various chapters. Aluminium is a metal with unique characteristics that make it versatile in many technological sectors, such as manufacturing industry, aerospace industry and building or electronic sector. With the development of production technologies, aluminium has found vast possibilities of use in the packaging production. This wide range of uses derives from its characteristics of lightness, malleability, non-toxicity, resistance to impact and corrosion, as well as offering a high barrier effect against external agents such as light, air, humidity and bacteria. In fact, aluminium packaging is generally easy to open, ensures long-life products shelf life and allows the optimisation of transport thanks to its lightness and strength. Another key aspect that has contributed to the diffusion of aluminium as packaging is the high possibility of aesthetic-communicative personalisation through numerous printing, finishing and ennobling processes. In fact, the material characteristics and its workability allow an effective communication that may not require the use of additional communication components such as labels. The creation of aluminium alloys with other materials (in minimal quantities) such as copper, zinc, manganese, silicon and magnesium, allows modifying and emphasising certain properties to make the material suitable for the type of function and application required. Alloy 8000 series: the primary element used in this alloy is iron, which gives high malleability; it is used to produce thin sheets, containers and screw caps. Aluminium, both pure and alloy, is 100% indefinitely recyclable without losing the virgin material properties. Through separate waste collection, aluminium packaging can be recovered and recycled to become new secondary aluminium ingots that can be used for the same applications as the starting material. Secondary production: aluminium scrap is recycled through material recasting. Aluminium (symbol Al) constitutes 8% of the earth's crust and is found in the form of a mineral called bauxite. Bauxite is a sedimentary rock (pink, red, brown or gray) that contains, in addition to aluminium oxides and hydroxides, materials such as silica, zinc and ferrous elements. The bauxite-aluminium ratio is 4-1 (we need about 4 tons of bauxite to obtain 1 ton of aluminium). Bauxite is currently extracted in tropical and subtropical areas: the main world deposits are in Australia, Central-South America (Jamaica, Brazil, Suriname, Venezuela, Guyana), Africa (in particular Guinea), Asia (India, China, Russia, Kazakhstan) and Europe (Greece). The deposits of this mineral are generally superficial and at low depth in the ground, which makes bauxite easy to extract compared to other minerals. Once extracted, bauxite is transported to refining plants where, through the Bayer chemical process, aluminium oxide is separated from other substances present in Bauxite through a solution of sodium hydroxide. The types of waste obtained from the alumina production are mainly two: water vapour and insoluble residues, called "red mud" due to the high presence of iron oxides. While the former does not present particular environmental issues, the latter presents several problems in terms of disposal. For this reason, “red mud” is usually placed in settling and accumulation basins, where can be used for the production of low-cost cement and as a possible natural source of iron. Following the Bayer process, it is necessary to cool and filter the solution to separate the aluminium trioxide (called hydrate) which precipitates in solid form. This crystalline material is heated to temperatures above 1000° C to remove moisture and obtain the alumina, which is then sent to the aluminium casting plants. Alumina is transformed into liquid aluminium inside special electrolytic cells, where it is brought to a temperature of 950° C in a fluorinated bath crossed by a high-intensity electric current. The electrolysis allows to decompose the alumina in oxygen, transforming it into carbon dioxide and releasing the elementary aluminium that is settled on the bottom of the tank. Primary aluminium is then purified by micro-impurities that form a superficial white crust, since it contains up to 70% of aluminium which can be partially recovered through fusion processes in secondary production. Finally, alloys are created by incorporating the different elements according to end-use applications. Aluminium is defined as "permanent material", a material that can be endlessly recycled, conserving the energy required for its various applications. The following is a brief overview of the recycling process. For a detailed and exhaustive description of the complete post-consumer recycling process, see Chapter 3. Secondary aluminium can be produced from pre-consumption or post-consumption scrap, even through separate waste collection. All waste undergo a first phase of selection that allows to separate the aluminium from other magnetic metals or from different materials (glass, plastic, etc.). At the end of the selection, the aluminium scrap is pressed into bales, then sent to the foundry and subjected to further quality control. Following that, it undergo a pre-treatment phase at about 500 ° C to eliminate any foreign substances, before reaching the actual melting phase, which occurs at about 700 ° C. The liquid aluminium is then transformed into ingots and slabs for the production of semi-finished products and new aluminium products, including packaging. Once obtained the aluminium from primary or secondary production, this is usually transformed into semi-finished products that act as a starting point for the different processes with which the final products will be obtained. Depending on the sector of application, there are several semi-finished products: wires, tubes, aluminium pads, billets, round bars and laminates. If we consider packaging production, the starting semi-finished product is usually a laminate obtained by a rolling process. In this process, aluminium is extracted from the melting furnace, solidified and processed to obtain 10-20 tons plates, using a semi-continuous casting process. The plate is subsequently heated to be homogenised and sent to the rolling mill, where it undergoes a rolling process (i.e. a reduction in thickness, which involves a "hot" phase and a "cold" phase). In the hot rolling phase, the plate is preheated to about 550 ° C and passed through cylinders that, at each passage, reduce its thickness increasing its length, from about 600 mm to 2-6 mm. The strip coming out of the cylinders is then subjected to cold rolling (about 100 ° C) which restores hardness to the aluminium and allows to reach a thickness between 0.20 and 5 mm. Combined rolling processes can make possible to produce aluminium laminates with a thickness of only 5 μm. Laminates are then sent to the following production stages for the actual packaging. This happens whether they are flexible, (e.g. sheets and polylaminates) semi-rigid (e.g. containers) or as rigid (e.g. beverage cans, food cans and screw cap). Thanks to its characteristics (see paragraph 2.a), aluminium is widely used in the production of predominantly primary packaging, lending itself well to the containment of products that require particular design features for protection, conservation and use, such as food products and personal care products. Depending on the packaging, there are different types of processing that start from a semi-finished product (usually aluminium laminate) to produce the actual packaging. Laminates for sheet production usually have a thickness of less than 2 mm. Aluminium sheets have a thickness of less than 10 μm and are obtained by passing two superimposed aluminium sheets under the cylinders. Once separated, each of the two thin sheets has a shiny part (the outer face in contact with the cylinders) and an opaque one (the internal face in contact with the other sheet). After being rolled and wrapped, the annealing phase reduce internal stress, clean the surface and give flexibility. Aluminium sheets are usually made of pure alloy of 1000 series. Alternatively, aluminium sheet can be produced from an aluminium plate through a continuous casting process, in which the molten metal is poured directly to obtain the shape of a thin sheet, which is then cooled, wrapped and sent to a subsequent cold rolling. Rigid packaging such as beverage cans are produced by a stretch-drawing process, starting from an aluminium sheet, as in the previous case. The process involves several steps that allow the sheet to be incised with a punch to obtain circular rough finished concave spoon shapes. These form the can after a drawing and ironing process in order to obtain a narrow, long and thin shape. The bottom recess is also created by punching to make the packaging more resistant to the internal pressure exerted by a carbonated beverage. The upper edge of the can is trimmed and finally the can is washed and dried in order to move on to the personalisation and coating phase. Painting does not take place only externally, but a veil of paint suitable for food contact is also sprayed internally to avoid any type of chemical interaction due to direct contact between the contents and the inner walls of the can. The last phase is the flanging of the end part of the can to receive the cover/lid after the packaging has been filled with the drink. The impact extrusion process is used for the production of various aluminium packaging, such as bottles, cans, tubes and other rigid containers. In this process, the products are cut from the starting plate with the circles matrix. Following that, they are placed between a matrix and a mechanical press. The press hits the pad making it protrude through the matrix. This operation gives the pad a shape that internally corresponds to that of the piston, and externally to that of the matrix. The excess material is then trimmed and the packaging goes through the washing and drying phase. Finally, the packaging is coated and personalised. For a detailed description of the functional and environmental characteristics of the various packaging types, please refer to chapter 3. Packaging design, as already mentioned above, must meet regulatory, functional and communication requirements. The emphasis is certainly placed on the protection and containment of the product, particularly in the transport and use phases, in order to guarantee safety, usability and communicative effectiveness in a creative and sustainable way. As previously written, environmental requirements are not just an accessory element but a transversal design area that should be considered when designing the functionality and communication of the packaging. Each of these macro-processes requires specific design measures to make the operations related to the end-of-life of the packaging easier and more efficient. These involve different actors: from the consumer who disposes the item in the right separate waste collection to the operators processing the material during the actual recycling phase. The objective of this chapter is therefore to provide designers with an essential but comprehensive vision of the collection, selection and recycling of aluminium packaging, allowing the development of design choices to make the end-of-life phase as efficient as possible. The knowledge about the collection, selection and recycling processes permit to reread existing and newly designed packaging according to a different interpretation, stimulating innovation in the packaging design phase with a view to recyclability and environmental efficiency. The design for recycling is constantly updated, in parallel with technological progress both in the production phase of packaging and in recycling: the contribution of designers is essential to respond with creativity and innovation to this challenge. aluminium foils for food storage. Separate collection of urban waste, which also includes the collection of aluminium packaging, is organised and managed by local councils. joint collection of glass and metals. In some rare cases it is also possible to have a collection of only metal packaging. Commercial waste collection systems can be similar to those for domestic municipal waste; for example in the case of bars, restaurants, hotels, airlines and other businesses. The systems in which large quantities of (already separated) recyclable waste are collected, have the advantage of producing a continuous supply of uncontaminated material to be sent directly to recyclers / foundries. In all cases, end users play a crucial role. Packaging design can significantly support users in their task of differentiating waste, directing them towards the correct recycling flow. The decision 97/129/EC establishes a voluntary system for identifying packaging materials and in particular recognises the use of a standard aluminium marking with the initials ALU and the code 41. The correct environmental packaging labelling is definitely an important tool for the user to identify the packaging material for the purpose of separate collection. Any multi-material collection system requires a subsequent phase of separation of the different materials: before being recycled into its flow, aluminium must be properly separated. This phase generally takes place in a special selection system through the use of automated devices. If we look at the aluminium sorting process, an eddy current separator is used to exploit the electrical conductivity of the metal. The device consists of a rotor with magnets configured with alternating poles on which mixed multi-material flows are conveyed. The rotors, with their circular movement and the arrangement of magnets, generate an electric field in all non-magnetic materials. The induced electric currents tend to vortex the surfaces of the conductive materials, giving rise to the current parasitic term ("Eddy Current"). The currents generate, through non-ferrous metal bodies, a magnetic field of its own, opposite to the main one. Objects are then pushed away from the separator. A barrier is erected next to the separator to divide metal objects rejected by other non-metallic materials. The distance between the eddy current separator and the barrier is calculated in order to allow the recovery of expelled metal objects (e.g. aluminium beverage cans). On the other hand, all other objects that do not interact with the magnets fall just behind the barrier. The repulsion force exerted by the parasitic current separator on metallic objects depends on the combination of shape, weight and electrical conductivity of the object itself. In this process, conductivity is generally the determining property for the process to happen. Most metal objects are rejected beyond the partition. However, some objects do not have sufficient shape and weight to be separated in this phase. Furthermore, composite packaging that contains laminated aluminium (e.g. beverage cartons or composite tubes) do not contain such aluminium amount to be selected together with metal waste. An eddy current separator generates a repelling magnetic force in objects with electrical conductivity. In this way, almost all of the metal that arrives at the eddy current separator will be aluminium. The selected aluminium is checked in qualitative terms and sent to recycling foundries. Any waste is subsequently sent to waste-to-energy plants or recovered through the production of Refuse-Derived Fuel (RDF). At the end of the aluminium selection process within the multi-material flow, aluminium is compacted into bales to optimise the transport to the foundry. Pressurised spray cans could represent a potential hazard at this stage of the process. For this reason, it is important to inform the end user on the importance of emptying the cans completely before placing them in separate waste collection, in order to avoid possible explosion risks at the final plants. Foundries represents the final phase of the recycling process, in which the real recycling of aluminium takes place. Here the material is pre-treated at about 500 ° C to eliminate all the elements that can affect working processes, such as paints and other adherent substances (glued labels, etc.). Subsequently the material is brought into melting furnaces where it is melted at a temperature of 700 ° C to obtain liquid aluminium, from which ingots and plates are made. These can be processed again to produce semi-finished products and new products. Special measures and technologies are adopted to minimise material losses due to oxidation. Aluminium plates are preheated to a temperature of about 550 ° C and through hot rolling and to the passage in cylindrical rollers the thickness is reduced to 2-6 mm. The plate then undergoes a "cold" rolling, about 100 ° C below the crystallization phase, which returns hardness and allows to obtain the desired thickness with a new passage through the cylinders, controlling the deformation. The tape is then rewound and reheated (annealing). The thickness obtained is between 0.20 and 5 mm. The laminates are then sent to various packaging production plants which, through combined laminating processes, can create much thinner sheets (up to 5 μm), depending on the types of packaging (flexible, semi-rigid, rigid). The material obtained from the melting process (recycled aluminium) has the same properties and qualities as primary aluminium and can be used for the same applications as virgin material, including the production of new packaging. In case of aluminium packaging erroneously placed in the separate collection, or of composite packaging that are not managed in the flow of aluminium collection, there is a further possibility of recovery following the thermal transformation of the undifferentiated fraction. In this process, in fact, waste undergoes a combustion process that allows the production of thermal and electrical energy. Aluminium packaging with a thickness of less than 50 microns, even when coupled with other materials, also produces energy in the combustion phase. Packaging and other aluminium objects with thicknesses greater than 50 microns, at the end of the incineration process, remain in the post-combustion slag (bottom ash) and can be extracted through sorting sections and, after adequate quality control, recycled in foundry. It is possible to separate waste from aluminium packaging from other undifferentiated waste even in Mechanical Biological Treatment plants (MBT) for the production of Secondary Solid Fuel (SSF). These can separate metallic material from the remaining fractions (putrescible and inert) and start of the fuel fraction thus obtained from a combustor. It is important to underline how these processes, although they allow the recovery of aluminium from the undifferentiated fraction, make further processing and material selection processes necessary. Recycled aluminium maintains the same physical and mechanical characteristics of virgin aluminium; therefore, it can be used for the same applications, both for packaging and products. The recycled aluminium supply chain no longer provides for the extraction of minerals but is based on the reconversion of the existing, with an energy saving of up to 95% compared to the production of virgin aluminium from bauxite. Recovery of material without qualitative decay. Recycled aluminium allows the material to stay inside the production cycle, thus avoiding the extraction and transport of raw material on a large scale and, at the same time, guaranteeing material that can be recycled repeatedly without losing the physical-mechanics properties of virgin material. Furthermore, the recycling process can also be done in places where primary resources are not present, bringing economic benefits to local areas. Energy savings compared to the primary process. In addition to energy saving for the extraction and transport of raw materials, there is less energy consumption for the production of aluminium ingots, which uses only 5% of the energy compared to bauxite processing. Reduction of mining activities. The use of recycled aluminium prevents the extraction of new raw material, using instead the material already present on the global market through the recycling process. Reduction of greenhouse emissions. Although not exempt from environmental impact, the life cycle of recycled aluminium generates lower emissions than virgin aluminium by avoiding the extraction process and significantly reducing the necessary transport phases. 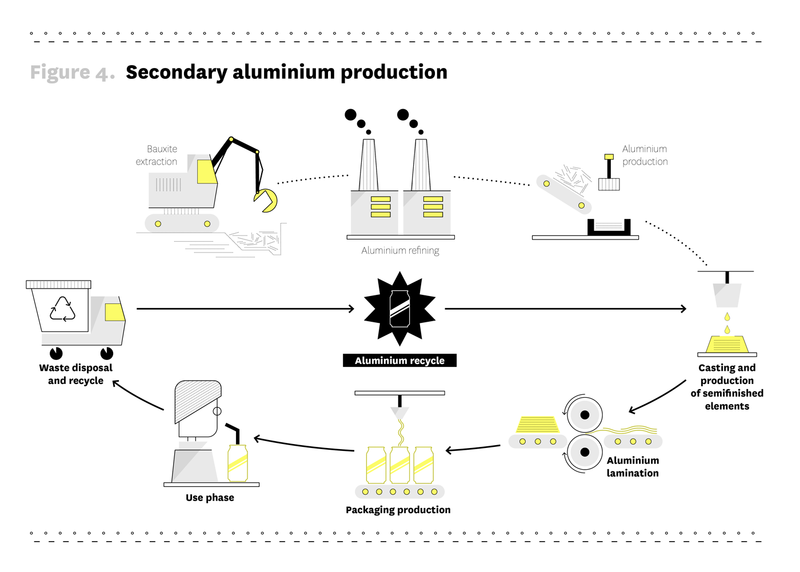 As highlighted in the previous paragraphs, the recycling activity of aluminium packaging is a sequence of consolidated and efficient processes that do not present particular issues, leading to the production of a secondary raw material that offers the same properties as the original material. Precisely because aluminium packaging recycling process has high potential in terms of efficiency, packaging design should take into account, on top of performance aspects, the impact of the end-of-life process in terms of quality and environmental efficiency. Some of these issues concern the entire recycling process, or some phases of it, while others are related to specific types of aluminium packaging. In the following paragraphs, we will address the general key points to consider when designing an aluminium packaging. In addition, we will discuss in detail the possible impact that individual types of packaging can generate on collection, selection and recycling processes. There are mainly five aspects of aluminium recycling that allow to act upstream in terms of prevention and design. The aluminium recycling process requires a much lower energy consumption compared to primary production, leading to the obtainment of a secondary material of similar quality compared with the primary one. The environmental impact is mainly related to heat treatments at high temperatures necessary for the melting of scraps that generate air emissions, usually higher than those of the primary process. This is mainly due to dust emissions generated by impurities contained in the waste, especially of organic type (fats, oils, paints, plastics and rubber). For this reason, it is important, from a design point of view, to consider solutions that are able to minimise these impacts, paying particular attention to using components in different materials, paints and other treatments. 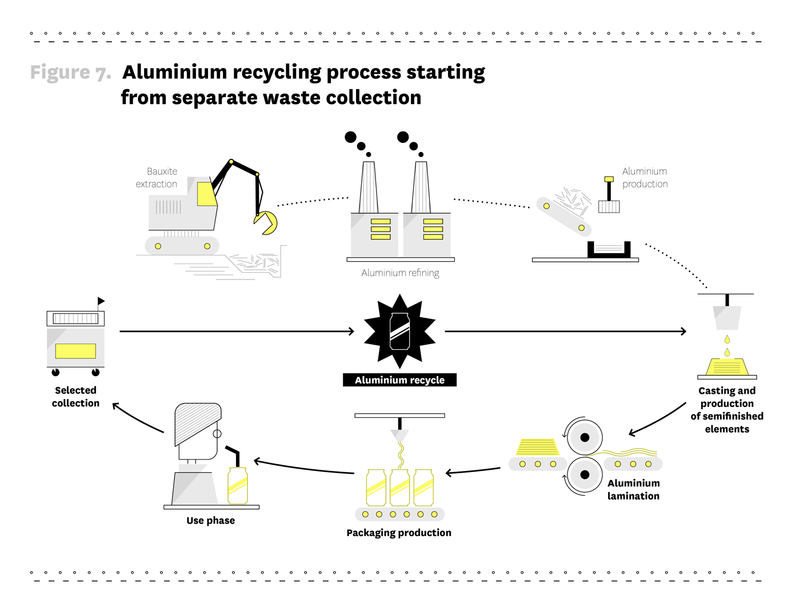 Quality control of aluminium waste entering the recycling process is essential to reduce impurities in the melting phase and to obtain high quality recycled material. In the mechanical screening process, aluminium packaging waste is sorted by wide-mesh conveyor belts, which collect small fractions of materials and foreign bodies (stones, paper, glass fragments, plastic) and small fractions of aluminium, like aluminium foil balls, capsules and screw caps. The so-composed undersieve is subjected to successive selection steps that allow the separation of all materials. Consequently, aluminium packaging design should find solutions that avoid the separation of the smallest aluminium components in order to recover them in the dedicated flow (for example, by keeping together the easy-open lid or the body of a can of tuna and other products with oil). Most of the aluminium packaging waste collected in the separate collection has residues of the contained product, whether solid, liquid or gaseous. Many residues can be eliminated during the selection and pre-treatment of aluminium. However, the end user should be encouraged but to carry out the complete emptying of the packaging. In case of spray cans containing propellants based on hydrocarbons, the emptying of the residual gas is essential to avoid safety problems due to possible explosions during the compaction of aluminium scrap in the selection plants. In many types of packaging mainly made of aluminium, secondary components of other materials are not always easily separable. Often the presence of these components can make more difficult to recycle the main body in aluminium, creating problems related to safety during the decoating of scraps and the lower quality of the recycled material. It is crucial to promote and facilitate the separation of the components of other material from the aluminium body. If this is not possible, the use of mono-material packaging is preferable. Low-thickness aluminium packaging (e.g. aluminium foil and containers), if not properly compacted, risk not being recycled due to their oxidation inside the melting furnace. This is due to their low density that causes them to float in the melted bath of molten salts, instead of being immersed. The pressing phase of aluminium scraps helps to reduce this phenomenon, the end user should be informed about the importance of compacting aluminium foil and other thin packaging before placing it in separate waste collection. 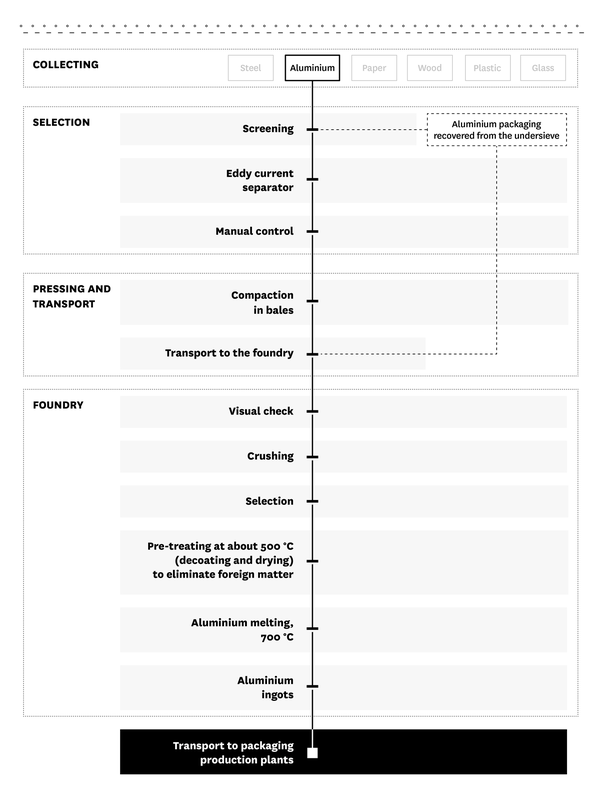 The aspects described above concerned aluminium packaging in general, but it may be useful to analyse the key points to be considered on specific types of packaging that have particular characteristics. The CiAl consortium proposes a division of aluminium packaging into three macro-types: Rigid, Semi-Rigid and Flexible. 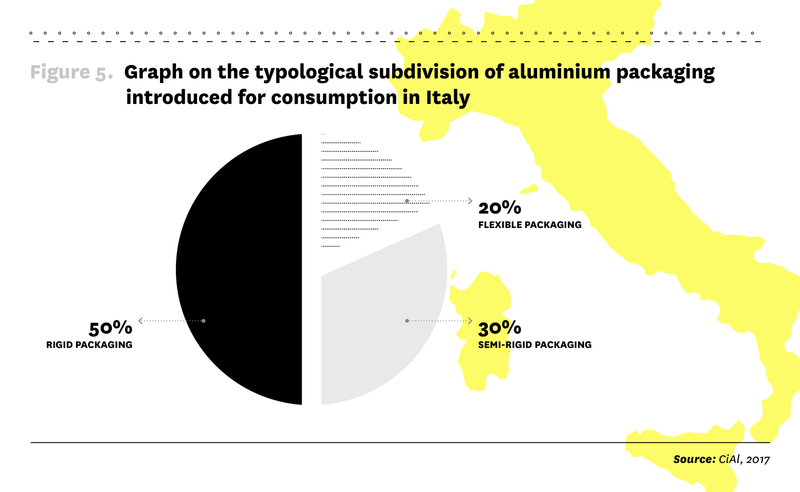 Rigid aluminium packaging represents the majority of aluminium packaging placed on the Italian market. This category includes three main types of packaging: cans, bottles and canned food. Cans are beverage packaging usually designed for a single dose and a single use. Their cylindrical structure consists of three parts: the deep-drawn bottom and body made of a single piece in 3000 series aluminium alloy; the top, in series 5000 alloy with a circular shape; the tab, also in alloy of the 5000 series. The top, with the tab already integrated, is joined to the body after the product filling phase. The top has a rounded opening that opens when the tab is lifted, even partially detaching it. The standard format of beverage cans is 330 ml, but there are numerous formats that can contain from 15ml up to 1000ml of product. Cans are mainly used to contain carbonated drinks (such as beers or soft drinks), due to their ability to withstand the pressure exerted by the contained gas. They guarantee long storage time, have an easy opening and cool down quickly. In addition, they are also very light, which favours the different transport phases. Cans are usually mono-material and completely recyclable. Over the years, industrial technologies have managed to significantly reduce the amount of aluminium used, from 20 g to 13 g for a standard 33 cl can, with related environmental benefits. In the design of cans, for recycling purposes, it must be considered that using different metals (usually steel body and aluminium cover) causes the aluminium component to be lost in the steel casting phase. Another important aspect to evaluate is that the wide use of paints with one or more colours for the personalisation can increase the polluting emissions during the aluminium melting phase and therefore increase its environmental impact. Bottles are a type of packaging made up of a single piece of aluminium that can be sealed by different types of closures (screw top, tear-off caps or crown caps). They usually have a capacity ranging from 250ml to 500ml but are also produced with different capacities, depending on use. They can contain drinks, detergents or other personal care products (soaps, shampoos, creams, etc.). Aluminium bottles are utilised for their lightness and the ability to withstand atmospheric agents. They offer characteristics similar to cans but differ from the latter due to the possibility of re-closing. Even the high possibility of communicative personalisation makes them interesting at the planning/design level. Being mono-material packaging, bottles are completely recyclable. However, caps are not always made of aluminium and it is possible to find them in tin or plastic. The end user is therefore responsible for their separation in the waste collection phase. Aspects to consider for recycling are the presence of additional components in other materials, such as labels or polymer components (caps), which if not separated by the user, must be treated via a crushing process. Like cans, the use of paints on the bottle body can increase the amount of polluting emissions during the melting phase. Food cans are mainly composed of two parts: the body and the lid. Once the body is filled with the product, the lid is closed. The lid can be removed with a can opener or has a tab that facilitates its lifting. Airtight covers or screw caps may also be present. Food cans are used for food that require long storage time without refrigeration. They are generally single-dose and non-reusable or reusable packaging. Although rarer, there are also applications in the non-food sector, and usually have a locking system with screw caps. Food cans are usually mono-material and completely recyclable. Smaller and low-density components (e.g. lids / covers) could end up in the undersieve during in the screening process and therefore undergo further selection process for the recovery of aluminium. Also in this case, the presence of paint on the packaging body can increase the quantity of polluting emissions in the scrap melting phase. Spray cans are used to contain liquids, creams, foam or gas. They are produced with the impact extrusion technique, which creates the body from a single aluminium pad. The dispensing valve (made of plastic and other metals) is inserted in the large upper cavity, allowing the controlled exit of the product. Together with the product, cans contain propelling gases that are based on hydrocarbons (e.g. propane) or not hydrocarbons (e.g. carbon dioxide, nitrous oxide). Inside the can, the product is separated from the propellant through an internal bag or a piston, which separates the liquid product from the gaseous propellant. Aluminium spray cans offer high resistance allowing the use of propellant gas to regulate the product leakage. They are also relatively light. Although they are easily recyclable, the design of spray cans requires some specific considerations concerning the material composition of its components and the contained propellant. First of all, the end user should separate the dispenser cap (usually made of plastic) and dispose it correctly in the separate waste collection. The pressurisation mechanism and the straw are generally disposed with the main body in aluminium: it is therefore necessary, for the purpose of recycling, a crushing pre-treatment. The packaging is crushed to decrease the volume and break the irreversible joints between the parts to separate the different materials. Concerning the type of propellant gas used, we have to consider that those based on hydrocarbons (if not completely dispensed during use) can generate explosions in the crushing process. Aluminium containers and trays are formed from semi-rigid aluminium sheets by an impact forming process. They are combined with an aluminium cover made by laminated foil with cardboard. In case of single-dose trays, they can be closed by an easy-peel lid in aluminium or plastic. Aluminium containers and trays are mainly used in the food industry for their insulating and barrier effect characteristics. Containers are usually easy to recycle. However, their reduced thickness (especially in easy-peel lids) requires correct compression / balling up by the end user to facilitate the selection phase and avoid oxidation in the melting furnaces. Often containers are treated internally with paints that prevent the transmigration of aluminium to the food. Besides that, they also present external painting for communicative personalisation: in some cases, paints can cause additional environmental impacts linked to the higher emissions of pollutants in the melting phase. Aluminium tubes are made from an impact extrusion process of aluminium pads. They generally assume a conical shape at the end, where they are equipped with a screw or flip top cap (generally made of plastic). They are manufactured with 1000 alloy which, thanks to its purity, promotes flexibility allowing it to bend and maintain its shape. They can be coated with a plastic film with graphic customisation. Aluminium tubes are used both in food and non-food sector (toothpaste, cosmetics, etc. ), for the barrier effect of aluminium and the flexibility given by the alloy thickness of the alloy. The product delivery by crushing prevents the air from entering, thus avoiding the product oxidation and ensuring a better conservation. Alloy 1000 is totally recyclable and any product residues do not affect the recycling process. Where a plastic cap is present, it the end user should separate the two components in order to direct them towards the respective recycling material flow. It should be noted that the reduced thickness of the bent tube could cause oxidation in the melting furnaces. Aluminium screw caps are used as sealing systems for aluminium packaging or other materials such as glass bottles. They are formed by extrusion from a single aluminium pad of the 8000 alloy. The cap is joined to a safety collar that guarantees the packaging closure during the selling phase. Screw caps are usually used to close aluminium or glass bottles. They are easy to unscrew and do not require additional tools to be opened or removed. Aluminium screw caps are totally recyclable. However, due to their small size, they are more difficult to select in the separation phase on conveyor belts. If disposed with glass bottles, they can end up in that recycling flow. CiAl, having considered the specificities of this type of packaging, has started a special program to recover aluminium closures and caps at the glass treatment plants. In the case of viscous products to be dosed (oil, soaps), there may be a double plastic component in the cap which allows controlled delivery and safe closure, which is not always easily separable from the bottle and / or cap. Aluminium capsules are the modern substitutes of lead sheets that covered cork stoppers to preserve wine and prevent oxidation. They can be coated with plastic layers. Aluminium capsules guarantee the closure of the bottle and, at the same time, can be easily removed during the consumption phase of the product. Aluminium capsules are completely recyclable, but due to their thickness they can oxidize in the melting furnace. Moreover, they are not always separated from the glass bottle and disposed in the correct way. Another aspect film that could compromise its recyclability is the coupling with plastic material film. Aluminium foil creates an effective barrier against external agents and is usually adopted for its lightness and the ability to maintain the shape after folding. It must have a reduced thickness, which is often less than 40 microns. Aluminium foil is used as protective envelope to preserve and conserve food organoleptic properties. Thicker foil is also used for peel-away opening systems. Aluminium foil is totally recyclable, since it is generally made of 1000 or 8000 alloys. Before disposing this type of packaging, it should be compressed and squeezed by the user in order to guarantee its selectability and avoid oxidation in the melting furnace. The project indications presented in the following paragraphs aim to provide concrete guidelines for aluminium packaging designing intended for domestic use, in order to facilitate recycling activities. Aluminium packaging has a great potential for recycling and the re-introduction of second raw material into new production cycles while guaranteeing the maintenance of the same technical characteristics of the virgin aluminium, even after countless recycling operations. The objective of this guideline is to provide an innovative approach aimed at stimulating a packaging design that optimises the recycling process in the post-consumption phase. This goal can be achieved in terms of quantity, quality and reduction of the environmental impacts associated with the various processes. In fact, the presence of components of different materials, the choice of thickness and shape, the residues and the use of paints can make aluminium packaging recycling more complex and, consequently, increase its environmental impact. 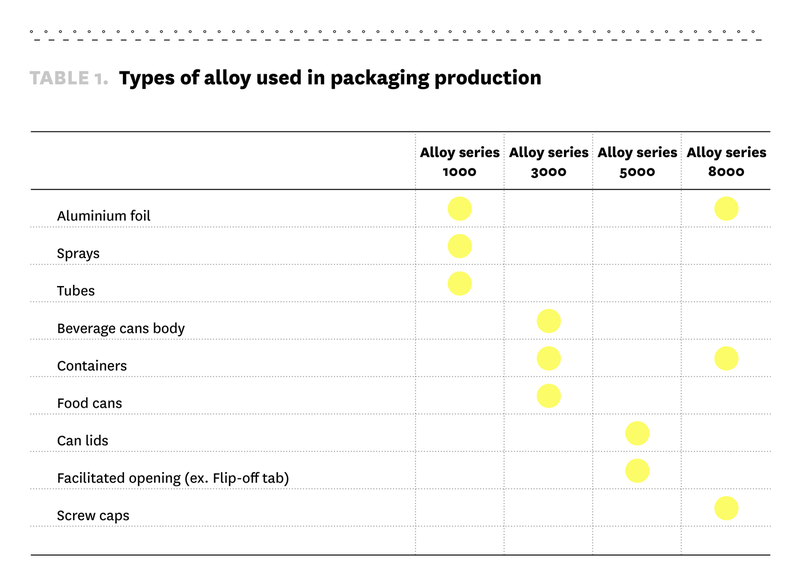 Although there are many types of aluminium packaging, some types (see Section 3.c) are representative of most of the packaging placed on the market. Rigid, semi-rigid and flexible packaging have peculiar characteristics but, in terms of recyclability, there are some common requirements that should be preferred. The guidelines presented here are therefore organised starting from the design aspects common to the different types of packaging, with any further information based on the typological category. While maintaining safety requirements as a priority, it would be important to design packaging with a constant focus on environmental issues. This can be obtained by using design solutions consistent with the existing recycling supply chain and favouring design choices that minimise the environmental impact associated with recycling processes. Some types of product might require a complex packaging and, due to its characteristics, could even pollute the flow of recycled material. Designers should analyse and design the packaging according to its recyclability, while maintaining the performing functions. In this regard, it is good practice that designers, transformers or user companies verify the impact of the solution that they are choosing on the recycling process. This aspect is as important as great is the product market share for which the packaging is being designed. In that case, the quantity of packaging waste that will flow into separate waste collection and into the selection and recycling plants will be greater. Another theme that is strongly linked to product shelf life preservation is the rationing of the portions, which sometimes become single portions for the purpose of reducing product waste. This happens, in particular, in the case of food or medical packaging and it is also due to social changes and family members reduction. Facilitating recycling activities does not mean, therefore, to discard a priori certain types of design solutions, but rather to calibrate a complex system of factors within in the relationship between content and container. These factors contribute primarily to the enhancement of products and, secondly, to the optimisation of recycling processes. Introduced by CONAI as one of the prevention drivers, the facilitation of recycling activities is achieved in all innovations aimed at simplifying packaging recovery and recycling; for example, the creation of mono-material packaging or the separability of the various components (e.g. labels, closures and dispensers, etc.). It is precisely for this reason that designers’ careful intervention becomes fundamental to make production increasingly adherent to circular economy demands, in which production "waste" process become "food" for the same (or another) process. These does not only present environmental benefits, but also evident economic advantages: the optimisation of the use of resources / times / activities. The European Commission estimates that it is possible to reduce the need for material production factors in less than twenty years almost 20% in Europe). The design indications presented above deal with five key aspects concerning the facilitation of aluminium packaging recycling. These have been identified focusing on the essential elements in regards with the selection and recycling processes (common all packaging types): shape and thickness, residues and emptying, surface treatments, components and training / information for the end user. Some design aspects are particularly significant and relevant for each individual type; in this case, we chose to provide with more detailed indications on the most critical packaging, from the design point of view and / or more significant in terms of their relevance. The indications provided in this guideline refer to current industrial selection and recycling technologies in Italy; they will therefore be constantly updated in order to adapt them to the most recent technology and market developments. We also have to underline how it was not possible to define a single and all-encompassing guideline valid for all types of aluminium packaging; as it is not always feasible to adopt all the proposed guidelines. The aim of this summary is to provide companies and designers with a tool to evaluate existing packaging and design new ones with particular attention to the end-of-life stage. The guidelines are therefore a support in the evaluation of the specific project case, which must find the correct balance between regulatory, functional, communicative and environmental packaging requirements. Aluminium packaging disposed in the separate collection, whether they are food or not, may have residues of the product contained in variable quantities. Several residues are eliminated during the selection and the pre-treatment phase of the aluminium, before the actual recycling. However, their presence can complicate recycling activities. For this reason, the packaging is a key aspect, recognised by Directive 94/62 / EC and highlighted by the UNI EN 13430: 2005 standard. The latter identifies among the applications for compliance with the recyclability requirement the possibility of "being emptied of contents sufficiently to minimise any further substance released / residual from the recycling process". In flexible aluminium packaging, such as tubes, the nature of packaging facilitates product emission. However, it might be possible that the user dispose the packaging containing a part of the product. This happens even more in packaging for food products, where the user does not completely empty expired food or products that are dense or difficult to remove. For this reason, designers should make relevant project choices to facilitate packaging emptying. Some examples are a wider opening, the creation of shapes that avoid points of accumulation of the product difficult to remove, the thinning of the packaging aimed at giving more flexibility, or through a communication that invites the user to completely empty the packaging before placing it in separate waste collection. It is particularly important to incentivise the complete packaging emptying in case of hydrocarbon spray cans, which can cause safety problems when compacting the aluminium scrap in the selection plants. Despite being easily recyclable, spray cans can present some difficulties in the recycling phase, due to both the propellant content and their components. Special measures are needed to improve sustainability and recyclability. 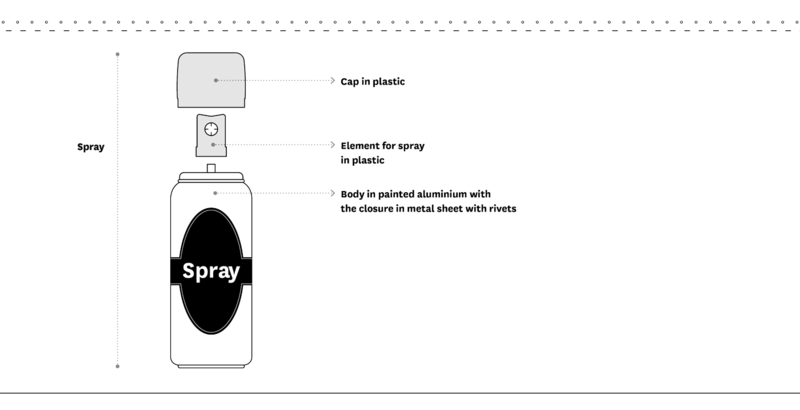 The propellants in the sprays can be of two types: based on hydrocarbons (e.g. propane), or not hydrocarbons (e.g. carbon dioxide, nitrous oxide). The former can cause safety problems when the container is drilled during compaction at a material selection and recovery facility. Although these structures are able to manage the safety risks deriving from hydrocarbon-based propellants, it is advisable to evaluate the use of an alternative propellant to increase the safety of the aluminium recovery. The packaging should also communicate to the user to complete empty the spray cans before the disposal in separate collection. The recurrent presence of plastic components is another key element of spray cans recycling of (see focus 1 section 4.e): in this case it is necessary to communicate effectively to the user the correct separation of the components. Communicate to the user the importance of completely emptying the packaging from any residual content, before disposing it to separate waste collection; for example, the user can be instructed to extend and refold the package (tubes) again to collect the residual product from the folded end. At the design level, shape and thickness play a fundamental role in the packaging functionality, both in terms of protection and performance effectiveness. In addition, the ergonomic use is also important because of its facilitation of the management/use of the product by the end user. At the same time, shape and thickness can also significantly affect the environmental impact: in the production phase (use of raw material), in transport (due to the weight and storage space optimisation), and at the end-of-life phase. While maintaining the objective of keeping functional performance, making design choices that reduce packaging thickness can bring environmental benefits in all phases of the life cycle and can facilitate recycling (or reduce the impact at the end-of-life phase). In particular, it may happen that some aluminium component, due to their small size or incorrect collection of waste by users (for example, aluminium caps are often supplied with a glass bottle), may not reach the aluminium recycling flow. In order to partially overcome this issue, CiAl has created specific programs aimed, for example, at recovering aluminium components at glass processing plants. Yet, reducing the thickness of small components deriving from aluminium sheet (e.g. screw caps, laminates for packaging) means decreasing the amount of material that is likely not to be recovered in the aluminium flow. Concerning shape, product protection and user fruition are the main design focuses, together with the undeniable communicative and identifying function performed by the packaging. The packaging design should be aimed at combining maximum functionality with features that make the disposal, selection and recycling operations easier. For instance, reduced thickness and shape such that the packaging would be recovered in the aluminium flow due to the possibility of flattening it and reducing its volume during the collection phase. On the other hand, aluminium sheet offers greater resistance to air due to its flat shape and its lightness. The study of shape can also encourage and facilitate the complete emptying of the product, to avoid further operations and possible problems in the recycling phase due to the contamination of the material by the product (see section 4.c). Aluminium foil for packaging require special precautions from the consumer in order to be properly recycled. In fact, the reduced thickness makes necessary to press the sheet to increase its density and facilitate its recovery in the flow. It is important to communicate on the packaging and to facilitate the sheet's roll-up by the user: this process not only favours the selection of the material being recycled, but also avoids that aluminium foil oxidise in the melting furnaces. In addition, the reduction in thickness (with same performance) can reduce the amount of material not recovered in the event of incorrect disposal in separate waste collection. Often glass bottles for wine or water use aluminium screw caps (usually 8000 series), which present high recovery and recycling potential. However, the cap could remain outside when the scrap is compacted without reaching the recycling plant. In addition, sometimes the consumer could re-introduce it to the bottle and dispose it in the collection of glass packaging. CiAl has created, in this regard, a recovery program called "Zero landfill, 100% recovery": this implies the maximisation of recycling, but also a greater environmental and economic impact due to the need for further processes to separate the cap from glass residues. Since sometimes caps cannot be recovered in the aluminium recycling stream, designing packaging with a minimum use of raw material can favour the reduction of the amount of material outside the dedicated flow and therefore not recycled. Limit as much as possible that minor parts of the aluminium packaging may come off, thus being dispersed during collection. Aluminium packaging can be subject to different types of surface treatment, which are often necessary to guarantee safety requirements (also regulated by dedicated regulations). Specific surface treatments are in fact necessary to make the packaging suitable to contain food or products for personal hygiene. Alongside these treatments to ensure safety, many types of primary packaging are subjected to different surface treatments (painting, embossing, texturing, metallisation, etc.) mainly for aesthetic and communicative reasons. Some common treatments (e.g. embossing) do not present issues during recycling while others require (e.g. some types of paint) the use of products with a high content of Volatile Organic Compounds (VOCs), involve environmental management costs during recycling and requires the use of special pollution control measures. Although direct printing on packaging is preferable to labels (see section 4.e), also in this case it is possible to opt for design choices that generate a lower environmental impact in the recycling phases. Limiting the printed surface of the packaging leads to a reduction in processing that involves the use of Volatile Organic Compounds, which do not affect recycling but increase its environmental impact and the measures necessary for controlling emissions. To overcome this issue, it is also advisable to use inks and lacquers with water or reduced VOC content. The use of a reduced number of paints is also another option to avoid additional thickness on the packaging surface. However, we should bear in mind that food packaging already contain a layer of paint that protects the food from aluminium transmigration and is therefore more important to limit the use of further layers of paint. If necessary, choose paints and lacquers with water or reduced VOC content. Many types of aluminium packaging use secondary components made of different materials. In some cases, this can affect the recycling of the main body in aluminium, causing safety problems during the scrap decoating and the quality of the second raw material obtained. This is the case, for example, of rigid plastic components: a high level of plastic contaminants of this type could in fact complicate recycling processes. In general, the choice of mono-material packaging is always preferable to overcome this issue. When this is not possible, the design attention must be aimed at making the components easily separable by the final user during the disposal phase, so as to allow correct differentiation and recycling. Non-aluminium components should be completely and spontaneously separable from the main body and that the final consumer should be encouraged doing so. We would like to highlight how communication plays an important role in inviting the user to recognise the material and separate the different components correctly. We should mention further considerations regarding the use of labels which, depending on the material and type, can also influence recycling activities and the related environmental impacts. Labels are usually made of paper or plastic film (shrink wrap labels are very common). Throughout the recycling process, labels often require additional processes in the pre-treatment of aluminium for the elimination of the glues used and the material itself. For this reason, it is preferable to avoid or reduce the use of labels in favour of direct printing. As highlighted in the guideline, the presence of plastic components, especially if rigid, represents a focal point both in terms of quality of the recycled material and in terms of safety during the decoating phase of the scrap. As far as possible, it is therefore preferable to avoid or minimise the use of secondary plastic components to optimise the recyclability and quality of the second raw material generated by the aluminium packaging. Although plastic labels are not excessively problematic for recycling, in some cases it would be preferable to avoid them. For instance, PVC film represent a contaminant during the aluminium re-processing, due to the high content of chlorine. There are types of packaging, such as bimetallic cans, in which the components made of non-aluminium material that are joined to the main body by irreversible connections (e.g. welding). For example, some beverage cans have a steel body and an aluminium closure. During recycling, these are selected from electromagnets and inserted into the steel recycling flow: the aluminium component is therefore lost. The use of only one material allows the correct recycling of the entire packaging, directing it towards the right recycling flow. Where it is not possible to opt for mono-material packaging, it is advisable to design the packaging in a way that components in different materials would be easily and spontaneously separated by the user during the separate waste collection. Prefer, if possible, direct printing on aluminium packaging, rather than using labels. Differentiated waste collection is the first fundamental step in the packaging recycling process. The end user plays a key role in recycling by enabling the management of the packaging at the end-of-life phase. Designers also plays an important role in adopting product and process measures to facilitate the user's task through a series of indications on the preparatory activities for the correct recycling of aluminium packaging. For example, the design could favour packaging emptying, components separation, lamination, rolling up by providing environmental indications on packaging material and its correct disposal. Further information should be provided on the disassembling operations of the various components (e.g. to ensure correct differentiation of the spray cans, the end user should separate the aluminium body from the plastic cap / dispenser), on packaging emptying of and the reduction of the volume before disposal. The identification code of the material can be added to facilitate the recognition of the packaging material. The choice is voluntary and the relevant provisions are dictated by Decision 97/129 / EC. The label and any messages on collection and recycling must be clearly visible in order to facilitate the packaging waste management. For aluminium packaging, the indication of the material must adopt the double-arrow circular mark bearing the abbreviation "alu", which allows to immediately identify the type of material and its recyclability, as well as the abbreviation "ALU 41", in compliance with the relevant legislation. For further information, please refer to the CONAI Packaging Environmental Guidelines. Secondly, it is strongly advisable to provide information aimed at indicating to the user the type and material and the correct disposal in separate waste collection. For these indications, please refer to the document Label for the citizen - Vademecum for a voluntary environmental label that guides the citizen to the separate collection of packaging. how should it be treated? (i.e. if it should be emptied, if its components are to be separated, if it should be rolled up or pressed). Provide specific instructions on the packaging management during disposal; for example, on laminates roll up, components separation and packaging contents emptying. LAW 170, 12 August 2016, Delegation to the Government for the transposition of European directives and the implementation of other European Union acts - 2015 European Delegation Law on light plastic bags, combustion plants, quality of petrol and diesel. Legislative Decree 39, 15 February 2016Implementation of Directive 2014/27 / EU of the European Parliament and of the Council of 26 February 2014 amending Council Directives 92/58 / EEC, 92/85 / EEC, 94/33 / EC, 98/24 / EC and Directive 2004/37 / EC of the European Parliament and Council, with the aim of aligning them with Regulation (EC) 1272/2008, concerning the classification, labelling and packaging of substances and mixtures. Directive 2008/98/CE of the European Parliament and Council of 19 November 2008 on waste and repealing certain directives. Transposed in Italy with the Legislative Decree 205 of 31 December 2010 "Implementing provisions for Directive 2008/98 / EC of the European Parliament and the Council of 19 November 2008 on waste and repealing certain directives". Legislative Decree 5 February 1997, n. 22 "Implementation of waste directives 91/156 / EEC, 91/689 / EEC on hazardous waste and 94/62 / EC on packaging and packaging waste"
Directive 94/62/CE of the European Parliament and Council of 20 December 1994 "Packaging and packaging waste"
Union of different metals bonded to each other. Compound mineral (AL203) present in clay that determines the strength and hardness of the clayey body. The mineral from which aluminium is obtained. Biological degradation process of organic materials, through the activity of living organisms, in basic substances such as water, carbon dioxide, methane, basic elements and biomass. Traditional name, still in common use today, of the chemical compound called hydroxide sodium (NaOH). It is strongly basic, for this reason it exercises, both in the solid state and in that state concentrated, a strongly corrosive action on the skin. Caustic soda is one of the basic products for the chemical industry. A restorative and regenerative industrial economy that aims to maintain products, components and materials always at their highest level of usefulness and value, distinguishing between technical and biological cycles. Packaging made by different materials which cannot be separated manually. For example, the following items are polylaminate packaging: beverage carton (polylaminate: paper, plastic and aluminium), bag made of aluminium foil coupled with paper, etc. Process by which paint, ink, paper, plastic and oil are removed from the surface of the aluminium material because of its recyclability. One of the techniques used for aluminium shape forming. It is used to produce objects with hollow form (e.g. pots). In mechanical technology, processing by plastic deformation of metal material normally carried out in cold conditions, and consisting in a reduction of sections of the manufactured articles. It is widely used in the production of profiled bars, tubes, rods and metal wires with excellent surface finish and high dimensional precision (cold drawn objects). It is obtained by passing the material through a calibrated cone shaped hole and converging in the direction of advancement via an appropriate pulling action exerted on the drawn material. Set of phenomena that cause chemical modifications to the species present in the electrolytic solution where two electrodes are immersed while a sufficiently high electric field is applied to their ends. Two electrodes are immersed in the solution: the one on which reduction processes take place (which require electrons) is defined as the cathode; the one on which oxidation processes take place (which release electrons) is defined as anode. According to the provisions of art. 218, paragraph 1, letter n) of the Legislative Decree 152/06, the energy recovery of packaging waste occurs when such combustible packaging waste is used to produce energy by a waste-to-energy process (with or without other types of waste) with heat recovery. Embossing is a technique used to increase the resistance and flexural stiffness of the material, allowing its use for beverage cans, food cans and materials with reduced thickness. It is obtained by pressing sheets previously plated, thick up to 0.8mm, between two molds engraved with decorations. Structure made of flexible or easily foldable material whose shape, after filling and closing, can change. Processing by plastic deformation of metallic material carried out by heat. Forging elementary operations are: drawing, performed to lengthen and flatten the piece; revolving, or upsetting, which has the opposite effect of the previous operation; narrowing, punching, cutting and bending. Industrial plant for casting metal. In chemistry, hydrocarbon is a generic name of all organic compounds formed only of carbon and hydrogen, whose molecules are composed of carbon atoms linked together to form open structures (i.e. acyclic, also called aliphatic) or closed-loop (i.e. distinguished in alicyclic and aromatic) while hydrogen atoms saturate the values ​​remained free. In particular: saturated h., those that have all carbon atoms united with simple bonds; unsaturated h., those in whose molecule there are one or more (double or triple) bonds; monocyclic h., cyclic hydrocarbons in whose molecule there is only one ring of carbon atoms, polycyclic h. others; polycondensates h., aromatic hydrocarbons consisting of several benzene rings having a carbon atoms in common. Hydrocarbons, which can be considered fossil organic substances, exist in very large numbers, mostly mixed together to form oil, bitumen, etc. They are gaseous, liquid, solid, generally colourless, insoluble in water, which are used as solvents, as fuels and as raw materials for the synthesis of numerous and important industrial products (including synthetic rubbers, plastics, pharmaceuticals and fertilizers). Plants that carry out a mechanical treatment of residual urban waste (MBT), possibly combined with a biological treatment of bio-drying or biostabilisation. “light” multi-material collection: includes the recyclable dry fractions of waste, excluding glass; it therefore covers materials such as paper, plastics and metals, reaching 30-40% of total waste. In chemistry, the combination reaction with oxygen; the reaction with which hydrogen is subtracted; the reaction with which an atom decreases its negative value or increases the positive one. Oxidation reactions are always combined with others of reduction. Total quantity per unit of weight deriving from external industrial sources, being material deviated from the waste stream during the manufacturing process. It does not include recycling of waste material carried out on site and materials derived from rework, pelletisation or cut-outs generated in a process and able to be reused within it). Total quantity per unit of weight derived from products previously used by consumers, such as households or business premises, industrial and institutional spaces in their role as end users of the product, which can no longer be used for its purpose. the content of hazardous substances in materials and products. The operation of creating a hole, or printing numbers, letters, symbols or acronyms in a metal surface, by means of a punch which, in the manual execution, is beaten with a hammer. the presence of dangerous substances, in particular for the purpose of combustion. Rigid structure made of stable materials, such as glass bottles, cans, etc. Mechanical process that takes place by opposing cylinderswhich, rotating on themselves, impress in the material the desired shape and thickness (rolling). The term lamination also indicates the operation according to which a printed sheet is covered with a thin protective layer of plastic or metallic material (a laminate). Any operation whose main result is to allow waste to play a useful role by replacing other materials that would otherwise have been used to perform a particular function or to prepare them to perform this function, either within the plant or in the general economy. Any recovery operation through which waste material is reprocessed to obtain products, materials or substances to be used for their original function or for other purposes. Includes reprocessing of organic material but not energy recovery or reprocessing to obtain materials to be used as fuels or in filling operations. Technological procedure aimed at freeing a product from polluting substances. Any operation by which products or components that are not waste are used again for the same purpose for which they were conceived. Screening is that process that sees an incoherent, granular or fragmentary mass passing through a sieve, both to separate the useful part from dross, waste, foreign bodies, and to divide the elements of a given dimension from others of greater size. Set of waste that goes through a recovery operation, including recycling. After the process, if all specific criteria are met, its status changed from waste to new material. It is the appropriate collection, according to criteria of economy, effectiveness, transparency and efficiency, of urban waste grouped into homogeneous product fractions. At the time of collection or, for the wet organic fraction, also at the time of treatment, as well as grouping waste packaging separately from other municipal waste, provided that all the above waste is actually destined for recovery. It indicates the estimated shelf life of a product, in other words the period during which the quality of the product remains unaltered. Solid fuel obtained (i.e. processed, homogenised and improved to a quality that may be the subject of specific agreements between producer and user) from non-hazardous waste, prepared to be sent for energy recovery in incineration or co-incineration plants. A liquid in which a solid, another liquid or a gas is dissolved. Process that create texture on the material, which can be obtained in different ways: by casting or molding in a mold on whose surface the motifs have been engraved; by lamination between engraved rollers (for example, the diamond-shaped stirae sheets used for stairs steps). Set of organic material, paper, cardboard, wood, plastics, glass, hazardous urban waste that is separated from the rest of waste according to size and type of compound within the Biological Mechanical Treatment system. Two lines of treatment can be created: that of the predominantly inorganic material (oversieve), which can be used for the production of CSS, and that of the organic material (undersieve) that will be used for biological treatment, in order to confer only waste already in the landfill stabilised. According to paragraph 11, article 268 of Legislative Decree 152/2006, VOCs are defined as any organic compound with a vapour pressure higher than 0.01 KPa at 293.15 K (20 °C). There are various sources of pollution of Volatile Organic Compounds (VOCs) in indoor air: “occupants" through breathing and body surface, cosmetic or deodorant products, heating devices, cleaning materials and various products (e.g. glues, adhesives, solvents, paints), clothes recently treated in laundries, cigarette smoke and office tools, such as printers and photocopiers. VOCs can cause a wide range of effects ranging from sensory discomfort to serious changes in health status; at high concentrations in indoor environments, they can cause effects on numerous organs or systems, in particular on the central nervous system. Some of them are recognised as carcinogenic to humans (benzene) or to animals (carbon tetrachloride, chloroform, trichlorethylene, tetrachlorethylene). Any substance or object that the holder discards, or intends or is required to discard. According to the provisions of art. 218, paragraph 1, letter n) of Legislative Decree 152/06, the energy recovery of packaging waste occurs when such combustible waste is used to produce energy via waste-to-energy (with or without other types of waste) with heat recovery.